Hello, I hope you are all having a good week. After all of these grey clouds I thought I would bring you some colour. So today I have some Art Party inspiration to share with you. 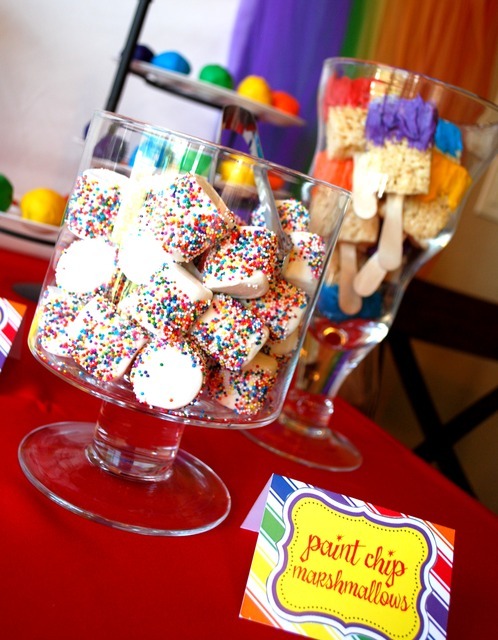 Just think of the fun you could have with little paint palette cookies or cupcakes decorated in an assortment of colours, displayed on a palette shaped board. Perhaps you could serve an array of coloured dips with breadsticks and carrots or celery as the ‘paintbrushes’. Ensure you guests arrive in painting clothes then have a giant canvas in the back garden for them to paint a big mural of all of their different paintings. Alternatively have smaller canvases indoors for your budding artists to paint. 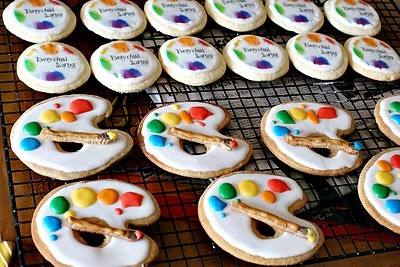 For older children you could have an artists style for the guests to try, they could paint self portraits Picasso style or recreate Mondrian masterpieces or even have a try at pointilism which could also inspire a painting similar to Aboriginal art. So paintbrushes at the ready, let’s gather some colourful inspiration! Let you budding Van Gogh’s have fun painting, but please remember aprons or old clothes, I’d hate for pretty party dresses to be spoilt. Have you hosted an art themed party? I would love to feature it here on the blog.